The Port Hope Area Initiative Management Office (PHAI MO) today received confirmation of funding from the Government of Canada, which will allow the Port Hope and Port Granby Projects to move forward into Phase 2. 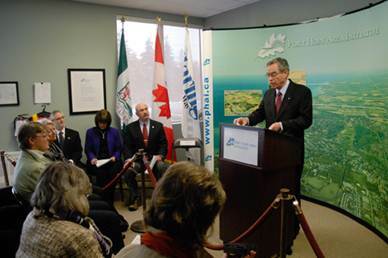 The Honourable Joe Oliver, Minister of Natural Resources, announced the $1.28 billion federal commitment at a media briefing at the PHAI MO, joined by Rick Norlock, M.P. for Northumberland-Quinte West, and the mayors of Port Hope and Clarington. The announcement formalizes the 10-year funding commitment for the cleanup of historic low-level radioactive waste. Hardy Stevenson and Associates Limited has led the Municipal Peer Review Team (MPRT) since 2001 for both Port Hope and Clarington. We are very pleased to hear this news and look forward to seeing the Projects move ahead! This entry was posted in Consultation and tagged environmental assessment, government, municipality, nuclear, peer review, politics, waste, waste management. Bookmark the permalink.